The Chesapeake Bay, not far from where I live, is famous for crabs, and locally, we celebrate summer with many crab festivals. As I was reading about an upcoming Blue Crab festival this morning, I remembered a fun tidbit about these colorful crustaceans and wanted to share it with you. Did you know that there is an easy way to tell the difference between a male and female blue crab? 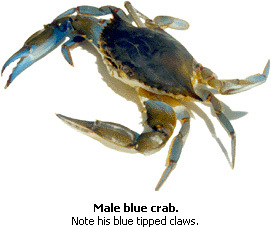 Male blue crabs have claws with blue tips and female blue crab tips have “painted fingernails” that are red. 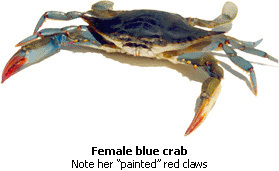 Fun to find out that male blue crabs have claws with blue tips and female blue crabs “paint their fingernails” red.